This event will feature a screening of Lynn Hershman Leeson's Conceiving Ada followed by a Q&A with the director. 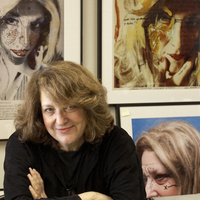 Lynn Hershman Leeson has been internationally acclaimed for her art and films. Her artwork is featured in the public collections of the Wilhelm Lehmbruck Museum, the Zentrum fur Kunst und Medientechnologie (ZKM), the Los Angeles County Museum of Art, The Tate Modern, The National Gallery of Canada, the Walker Art Center and the Museum of Modern Art, in addition to many celebrated private collections. She received the d.velop digital art award (d.daa), in Berlin, for Lifetime Achievement in the field of Media. She has also received a John Simon Guggenheim Memorial Foundation Fellowship. A major retrospective and catalogue is scheduled in 2014 at the ZKM Museum in Germany and the Museum der Moderne Museum in Salzburg. Five of her feature films – The Electronic Diary, Conceiving Ada, Teknolust, Strange Culture, and !Women Art Revolution – have been showcased at the Sundance Film Festival, Toronto Film Festival and The Berlin International Film Festival, among others. They have also been awarded many honors, including the Alfred P. Sloan Award for Writing and Directing and the Best Film on Art in 2011. All of her feature films are in the collection of the Museum of Modern Art. She is currently serving as the 2013-2014 Dorothy H. Hirshon "Director in Residence" in the School of Media Studies at The New School.